Almost every single day there’s a startup enterprise coming out of Africa. Within the many African businesses, there are some worth highlighting and shedding light on. The following is one that uses cocoa to generate financial, medical, and educational security for rural communities in Ghana. Cocoa360 is a community-based organization in Ghana that uses proceeds from cocoa farms to run health clinic and tuition-free school for girls. This social enterprise was spearheaded and founded by Shadrack Frimpong of Ghana. Although he traveled abroad to the University of Pennsylvania on full scholarship for undergrad to obtain a bachelor’s degree in biology 2015, his soul and heart always yearned to do something impactful and significant back home that revolved around education and health. Shadrack was blessed to win the Amy Gutmann President’s Engagement Prize (PEP) , a prestigious award of higher education in the United States. As a reward, he was provided with $100,000 to support a project of his choice and $50,000 for his personal living expenses. Shadrack decided to put his prize money towards the construction of a facility that would comprise of a school for girls and a medical clinic for rural areas, the Tarkwa Breman Model School for Girls and Community Clinic . With the support of his parents, he met with his hometown’s village chief. They donated about 50-100 acres of land to him, which the initial facilities were built on. A portion of that land was cultivated to farm cocoa. 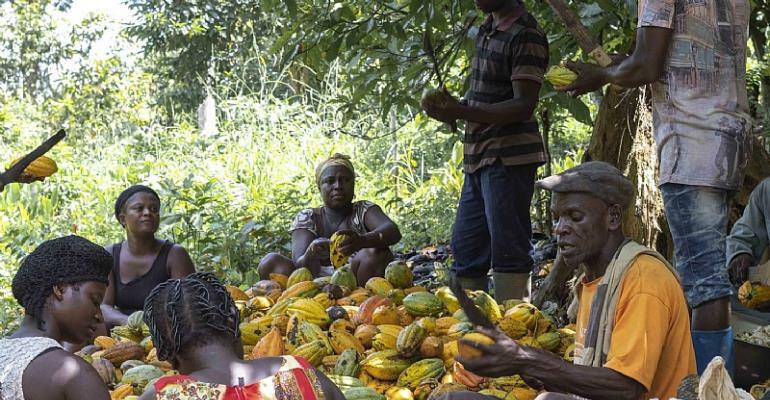 Revenues from the cocoa crops helped to cover free education for girls, the school’s maintenance costs, and the school’s library to the community. The community clinic has had consultation rooms, a pharmacy, a dressing/injection room, a laboratory, a delivery room and an on-call room. 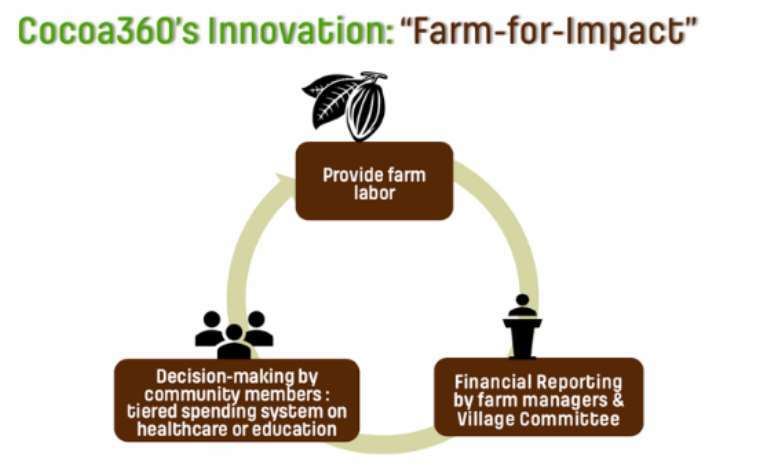 It must be noted that Cocoa360 has evolved to fully embrace “ farm-for-impact ” model and uses proceeds from community cocoa plantations to self-sustain its hospital and school. With this simple and straightforward model , it has been able to connect with cocoa-producing communities and identify their greatest academic and/or medical need(s). Then, it manages the proceeds from the cocoa produced in these communities to improve education and healthcare. The Cocoa360 project makes sure they work with a local village committee . This always serves as a strong link between the organization and the community to ensure that the programs adopted have the best interests of all parties. After harvesting, Cocoa360’s farm manager and the village committee meet to give a financial report to the community. The family members who have worked on the farm and community members vote on how the profit will be used to offset non-salary expenses like uniforms, books, transportation, and so on. Essentially, it’s about pulling resources together (both labor and land) at the community level to produce large amounts of cocoa for sale. Whereby, the proceeds are used to set up and manage schools and healthcare centers or disbursed in any other way the community deems necessary. The overall goal is to place lots of decision making in the hands of the community members. That way, the family and the community play an active role in the decisions to ensure their child will have quality education. It’s important that such people participate in the revenue generation discussions because in Ghana money means a lot. So far, they have enrolled over 120 young girls into their tuition-free school . Each term , they admit only 30 female students. Preliminary monitoring and evaluation report show clearly that their student attendance rate is at 98%, compared to the statistics of 60-70 % attendance rate of other rural public schools in Ghana. There are over 30 staff members ( about 95% of whom are local Ghanaians ), and they directly serve over 30,000 farmers and their families. They have drilled 2 boreholes on their campus, each providing over 4,000 liters of clean water daily. Cocoa360 currently has administrative offices in Ghana, London , and the United States . While the office in Ghana is mainly for day-to-day operations, both other offices are for fundraising purposes. That is, according to founder. To date , they have provided care to over 3,000 patients at their health facility and overseen the successful delivery of up to 40 newborns . Annually , they anticipate that about 240 children will be immunized, over 450 babies will be delivered, and over 930 malaria clients will be in their care. At the end of the day, this organization is helping farmers, families, and young females to live a prosperous, healthy and literate life in Ghana respectively. Kudos to Cocoa360 for doing business in Africa for a great purpose!